As we all know, good soils are the key to growing any type of plant well: annuals, perennials, turf, shrubs, and trees. The Chicago region’s soils are twofold, having positive and negative virtues. On a positive note, our soils tend to be rich in nutrients. But on a negative note, our soils are heavy and do not drain well. The soils at the Chicago Botanic Garden are very typical urban soils, and we have the same challenges. Over the years we have tried many types of amendments to improve our soils and are about to embark on another trial…biochar. Biochar has been used for thousands of years in the Amazon Basin of South America to greatly improve poor, unproductive soils for farming. The ancient Amazons used a simple “slash-and-char” process to create biochar. This process involved cutting and burning plant material in an incomplete “smolder” style, rather than complete burn. They worked the charred material back into the soil as a long-lasting amendment. These amended soils in the Amazon have become known as “black earth” or terra preta. Amended terra preta soils created long ago still cover 10 percent of the Amazon Basin. It is important to understand that “slash and char” is different than “slash and burn,” which has many negative environmental implications, like deforestation. “Slash and char” sequesters large amounts of carbon in a stable form, unlike “slash and burn,” which releases the carbon into the atmosphere. In the past decade, the use of biochar has been investigated for modern agricultural use; more recently in arboriculture, as well as general use in ornamental landscape plantings. The Morton Arboretum and Bartlett Tree Experts have conducted several recent research trials on biochar with very positive findings. One study found the root mass of test seedlings (honeylocust) grown with biochar was significantly more compared to their control group. Another study showed improvement in plant disease resistance when biochar was used. So what exactly is modern-day biochar? 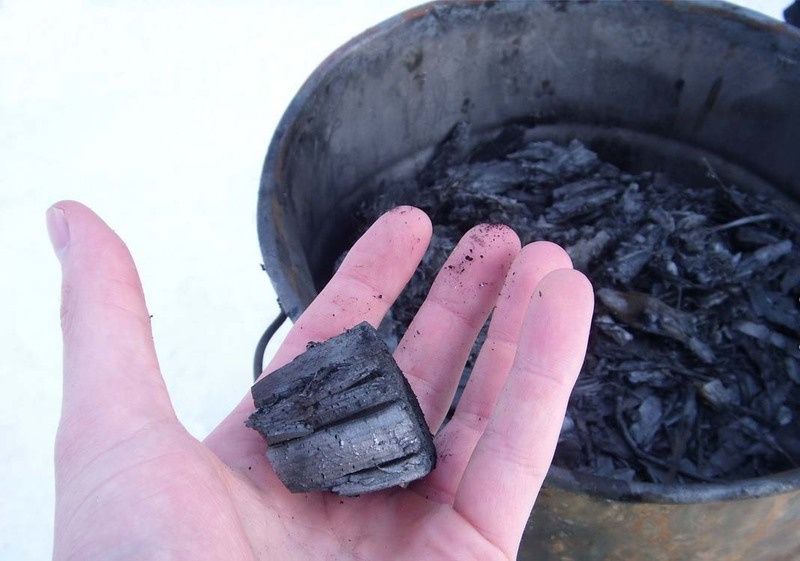 Biochar is similar to charcoal, except it is formulated specifically for soil enhancement. It is basically organic matter (primarily wood chips) heated in the absence of oxygen, a process called “pyrolysis.” The resulting char is carbon rich and has many long-lasting virtues. Think of it in the simplest of terms as a “sponge”: it has great capacity for holding and releasing nutrients and water. This year the Garden has begun to use biochar in some of our more troublesome areas. We don’t look at it as a “silver bullet,” but as another tool to combat problems caused by poor soils. This new tool is being trialed and then possibly integrated into our arsenal for best practice soil management.